We've printed a tabloid size-20 page supplement for the exhibit, you can pick one up the next time you visit or you can view it online HERE. 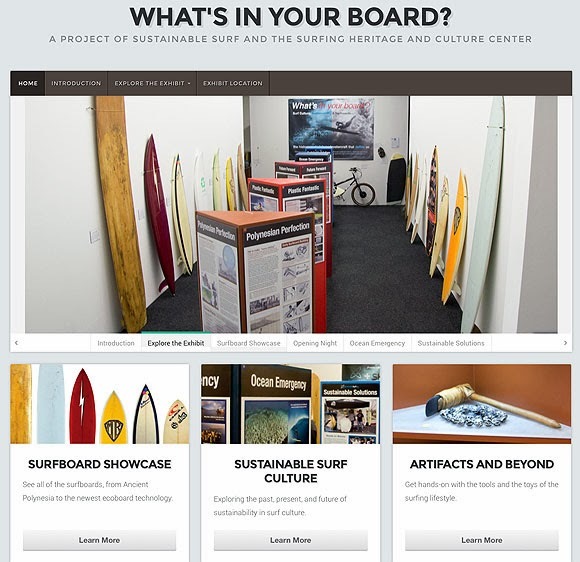 Discover the roots of sustainability within surf culture, as seen through surfboard history, design and materials as we look for better answers. Explore the surfboard’s idyllic Polynesian beginnings, its petrochemical past & present, and its current, cutting edge future – through a selected gallery of game changing surfboards. Join us as we explore 'Deep Blue' choices available for dramatically improved surfboard materials and the other positive impacts our individual actions can have right now in our local communities to help ensure surfing's sustainable future. Featuring boards from Channel Islands, Lost, Firewire, Timmy Patterson, Grain Surfboards, Brink Hydrocraft, Jon Wegener, Stretch Surfboards, Enjoy handplanes, and a selection of boards from the SHACC collection. CLICK HERE to learn more about the Waste to Waves program.